“For life.” That’s what the word probiotic means, and it’s a fitting name as these beneficial microorganisms are crucial for optimal health and longevity. Different strains of these helpful organisms normally live in the GI tract, working together to keep every cell in your body in good working order. According to the Microbiologist Kiran Krishnan, "The most recent studies over the last 5 years have shown that this leaky gut phenomenon is likely the driving force behind such chronic disease like heart disease, cancer, diabetes, Alzheimers... even Parkinsons' (disease). What we were able to show is that Just Thrive Probiotic- in 30 days- was able to reduce leaky gut by over 60%!" Supplementing with the right probiotics can rebalance your gut bacteria and restore a healthy GI environment. The problem: Most probiotic foods and supplements don’t supply beneficial bacteria that survive all the way through your digestive tract and arrive alive to your intestines, where your body can put them to work. And that’s where spore-form probiotics make all the difference. Unlike the most commonly known and used probiotic strains – the ones listed on yogurt labels and found in top-selling supplements – these especially hearty microbes can survive anything man and nature throw at them. Most commercially available probiotics die before you ever get a chance to take them – and those that do make it that far can be killed off by stomach acid, bile, and body heat.But spore probiotics, like the four proven strains found in Just Thrive Probiotic arrive in your gut alive, strong, and ready to go to work. As you can imagine, probiotics that are DOA in your GI tract offer no benefits, no matter how many billions of them your supplement supplies. That’s the beauty of spore-form probiotics: They come with a sort of protective shield that keeps them safe until they’re ready to spring into action. These spores act sort of like the seeds you’d plant in your garden. They exist in a sort of dormant state (like hibernation) until the environment is just right for them to wake up, grow, and colonize. As soon as they hit your stomach acid, these spore-form probiotics start to stir. They absorb water, and start to produce little shoots that begin to transform into full-fledged beneficial bacteria. As they hit the small intestine, they begin to multiply and move to areas (like the intestinal wall) where they can colonize. This process sets off a sort of revitalization in your gut, where these and other beneficial bacteria thrive, making it much harder for any bad bacteria to gain a foothold. It makes a lot of sense when you think about it. 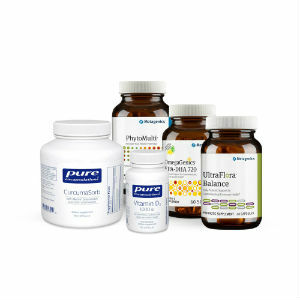 Spore-form probiotics are the kind nature intended us to take. You see, we used to eat dirt. It was on the fruits and vegetables we’d pick from plants… it got on our hands… and it made its way into our guts. And along with that dirt came the spore-form probiotics that naturally existed in soil. But then we started washing and sanitizing our hands and our food, and we lost our natural source of beneficial spore bacteria. But there is a very easy way to bring back those naturally superior probiotics, restore the right balance in your gut, and revitalize your GI and overall health. Bacillus indicus HU36 produces a range of vitamins plus highly absorbable antioxidants including beta-carotene, lycopene, lutein, zeaxanthin, astaxanthin, and CoQ10. Bacillus subtilis HU38 produces natural antibiotics that help kill off pathogenic bacteria. Bacillus coagulans produces a special form of lactic acid that improves urinary tract health and helps balance pH levels in the gut. Bacillus clausii stimulates antibody production to give your immune system a powerful defensive boost.